The Toronto Raptors are the second best team in the NBA with just a mere .4% lower winning percentage than the Milwaukee Bucks who they beat Saturday, December 5th, 2019 123-116. The Raptors lead the NBA with 29 wins. They employ an absolute basketball superstar in one Kawhi Leonard. They also boast perhaps the most improved player in the game and potential future superstar Pascal Siakam. OG Anunoby is another bright young star that the Raptors hope will break out soon and fourth-year player Norman Powell seems to have rediscovered his game after a disappointing season last year. Overall, the Raptors are in the midst of completing a 6th straight successful season. Expectations are actually higher this year after they acquired Kawhi Leonard and Danny Green from the San Antonio Spurs but they appear on track for hopefully at least the Eastern Conference Finals. There are flaws with this team and the style of play head coach Nick Nurse has the roster implement on the court. They take lots of three-point shots (33 per game) but are 25th in three-point field goal percentage at 34.1%. Nick Nurse’s decision to play small ball and separate big men Serge Ibaka and Jonas Valanciunas, by bringing Valanciunas off the bench, has meant the Raptors struggle with defensive rebounds and currently sit 12th in team defensive rebounds. 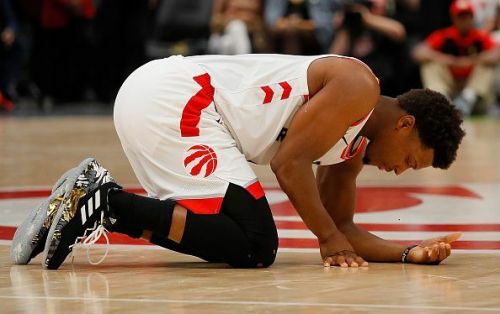 The injury bug has also hit the Toronto Raptors with Valanciunas currently out of the line up because of a broken thumb and Kyle Lowry day to day with back problems. But if Leonard is an absolute basketball superstar, Lowry is the absolute engine that makes the Raptors work like a well-oiled machine. He is a distributor of the basketball setting up teammates with pinpoint passes leading to easy baskets. Lowry averages 9.8 assists per game this season. 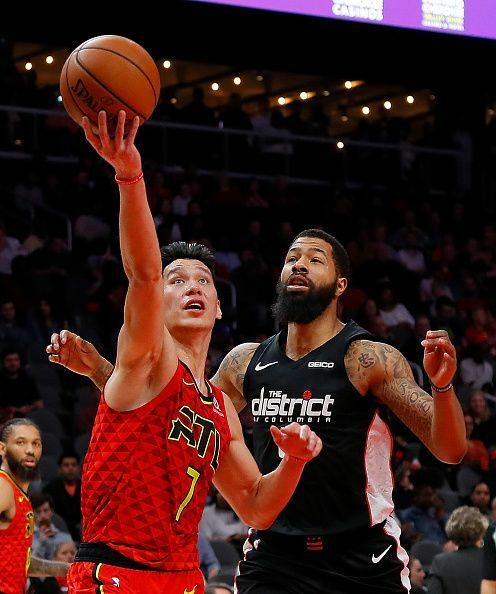 He is also a big shot maker bailing the Raptors out at the back end of shot clocks with long-range three-pointers or drives to the basket resulting in necessary points. Lowry is also a defensive leader. He sacrifices his body taking charges and is 5th in the NBA having drawn 13 charges against opponents. Lowry rebounds extremely well for a point guard and averages 4.5 per game this season. The problem is Lowry’s back. As deep a team as the Raptors are and as good as Fred VanVleet is, he is not Kyle Lowry. Lowry has now missed 11 games this season mostly due to injury and this is his second stint this season with back woes. The Raptors' offense struggles when he does not play. Here is a look at four potential players the Raptors could target in trades to strengthen their point guard spot and secure their elite status. The Atlanta Hawks already have their present and future secure at the point guard spot in Trae Young. With a record at 11-27, the Hawks are more interested at this stage in the NBA Lottery Draft in June. Lin, in the last year of his contract, would be a perfect fit for the Raptors. Lin is only 30 years old and is the type of player that fits any role he’s given. He was nearly a New York Knicks' cast off in 2011 when he managed to start 25 of the 35 games he played that year scoring 14.6 points and averaging 6.2 assists per game. He has run the Houston Rockets offense in the 2012-13 season as well. While he has been relegated to a backup role mostly since 2013 and is coming off of a knee injury, he would be backing up Lowry or VanVleet in Toronto. He would get starts when needed allowing VanVleet to continue coming off the bench. In cases where Lowry can’t play, Lin could be the primary ball handler and VanVleet could move to the two guard if they play together. VanVleet tends to be a scorer more than a distributor. If head coach Nick Nurse chooses he could continue to start VanVleet in Lowry’s absence but bring Lin off the bench as the point and have a bigger 6’5 Delon Wright play shooting guard on the second unit. Lin, in the last year of his contract, is getting paid $13.768 million for the year. The Raptors could offer up C.J. Miles, Greg Monroe and a 2nd round pick and make a play to obtain Jeremy Lin. The Raptors might even want to expand this deal and bring back one-time Raptor superstar Vince Carter who also toils for the Atlanta Hawks. NBA 2018-19: What is affecting Kyle Lowry's form?